tags: homestead history, local, Reading town, staircase of doom, welcome! Today is the anniversary of my arrival in the Wendy House of Dangerous staircase fame. 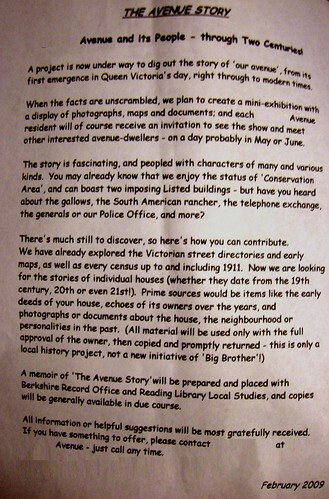 Locals on the Avenue are building a social history of the Avenue that will will be displayed in a local show this summer then given to the Berkshire County record office. The local retired fellow who’s coordinating the activity stopped by with a letter, to chat over tea. I’ve contributed gossip, rumour and scanned copies of the house title deeds. I have three things in common with all the previous residents of the Wendy House, unmarried, working, girl. This scribble was published on Sunday, March 1st, 2009. You can follow any banter on this scribble with the RSS 2.0 feed. You can share your inspired musings after typing the anti spam word near the bottom of the page. But no Pinging because its too naughty. Come on, give us the name of the Avenue!